BEIRUT -- A Syrian military official said Friday that an airstrike by the U.S.-led coalition on a government military position near the border with Jordan had killed several soldiers and caused material damage. The unnamed official's comments were carried by Syrian state TV a day after the U.S.-led coalition said a U.S. airstrike had struck pro-Syrian government forces that the coalition said posed a threat to American troops and allied rebels operating near the border with Jordan. The attack was the first such close confrontation between U.S. forces and fighters backing President Bashar Assad. Russia also criticized the strike, with Deputy Foreign Minister Gennady Gatilov Gatilov accusing the U.S. on Friday of violating Syria's sovereignty and alleging the airstrike hit civilians, according to Russian media. The official cited by Syrian state TV only mentioned "one of our military points" being targeted, without providing further detail. The official did not give a number for how many soldiers were killed, but said the Syrian army was fighting terrorism and no one else had the right to decide in which areas it can carry out operations. On Thursday, the U.S. sent aircraft to strike Syrian regime vehicles that violated a "deconfliction" zone set up around al-Tanf, an army base where U.S. and allied special forces are training Syrian militias, CBS News national security correspondent David Martin reported. American officials and Syrian activists said the strike hit the pro-Syrian government forces as they were setting up fighting positions in a protected area in the desert near the border with Jordan. A bulldozer and a tank were hit, but U.S. officials said it was unclear on Thursday whether they had struck the Syrian army or just militias allied with the government. Speaking to reporters on Thursday, U.S. Defense Secretary Jim Mattis said the U.S. would defend its troops in case of "aggressive" steps against them. He was asked if the airstrike represented an increase in the U.S. role in the Syrian war. "We are not increasing our role in the Syrian civil war, but we will defend our troops," Mattis said. "And that is a coalition element made up of more than just U.S. troops, and so we will defend ourselves (if) people take aggressive steps against us." The U.S. strike marks a new approach in what has become an intensely crowded and complicated war zone. 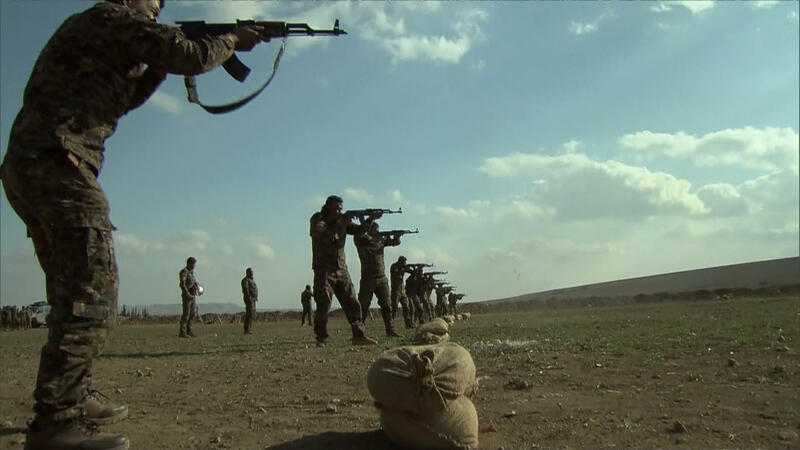 Thursday's strike was the coalition's first on pro-Assad forces in the battlefield. The coalition had so far kept its military operations focused on Islamic State militants and al-Qaida-linked groups. Operation Inherent Resolve, the U.S.-led campaign against the Islamic State of Iraq and Syria (ISIS), said in a statement that "the coalition struck pro-regime forces that were advancing well inside an established de-confliction zone" and "posed a threat to U.S. and partner forces."